I said I would never be one of those people who purchased high end mascara because of how disposable they are as the makeup with the shortest lifespan. However after trying a sample of Benefit's They're Real! Mascara I have completely changed my mind and started thinking up a whole mess of justifications for this purchase. This is seriously the best mascara I have tried in awhile and is so perfect because it combines a lot of benefits into one tube. Previously I have been combining the powers of two different drugstore mascaras to achieve the perfect length to volume ratio, but this one totally blows those two out of the water. This mascara retails for $23, if you purchase it online from the Benefit website there's actually a set that gives you a full sized mascara as well as a travel sized one for the price of the full sized so if you ever hunt down some free shipping codes I say that is a pretty nice deal. First of all I love this brush. It is a pretty average brush made up of hard spikes with no curves or eyeball fitting shades. There is the added feature of a small spiky ball at the tip of the wand that acts as an awesome tool to get those hard to reach outside lashes, and also works to fan out said lashes to really open up your eyes and get that baby doll look. I don't know about anyone else but I always had an issue getting those outside lashes and inevitably would get a blob of mascara on my skin and then have to suffer through a very messy cleanup process. This formula is absolutely amazing, it is wet and very easy to apply. First of all it is the blackest of black, wears all day, does not flake and in general does not budge no matter what you do to it. If you manage to get a clump out of this stuff, I applaud you because I find it very hard for this formula to clump up. I love piling on my mascara making it as dark as possible and I must say that one swipe of this stuff achieves the look of what I get after ten layers of any other brand. 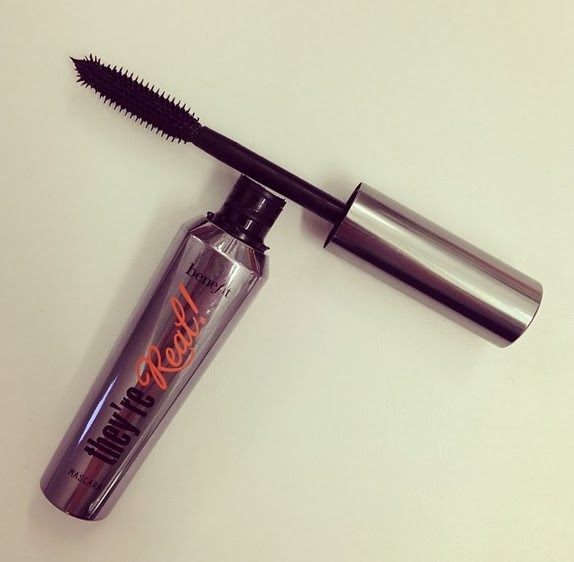 What I love most about this mascara is that it lengthens, volumizes, separates and curls my lashes in just one tube. I have the most stubborn straight lashes ever and even without the use of an eyelash curler, this mascara creates a beautiful curl and holds it all day long. With the use of the little spiky I can easily achieve a beautiful full look that really rivals false eyelashes, and it works even with my average length lashes which appear to curl downwards, transforming them into enviable doll lashes. Just check out some of these pictures of people showing off their lashes here. Have you tried They're Real! Mascara? What did you think? What are some of your favorite mascaras?